Kellogg Community College’s women’s volleyball team fell to conference opponent Ancilla College in five sets Thursday at home in Battle Creek. It was the Bruins’ first match in the brand-new Miller Physical Education Building, which officially opened to the public earlier this month. Ancilla took set one 25-21, set three 25-20 and set five 15-7; the Bruins took set two 25-18 and set four 25-19. KCC was led on the court by freshman Maddie Jones, who had 44 assists, 2 aces and 7 digs; sophomore Kameron Haley, who had 11 kills, 22 digs and 2 aces; sophomore Kirby Frodge, who had 15 kills and 11 digs; and freshman Jackie Mason, who had 8 kills, 13 digs and 1 ace. Head KCC Coach Tom VanWienen said it was a decent start to the season. The loss brings the Bruins’ record for the season so far to 0-1. The team’s next match starts at 6:30 p.m. Thursday, Aug. 30, against conference opponent Jackson College in Jackson. 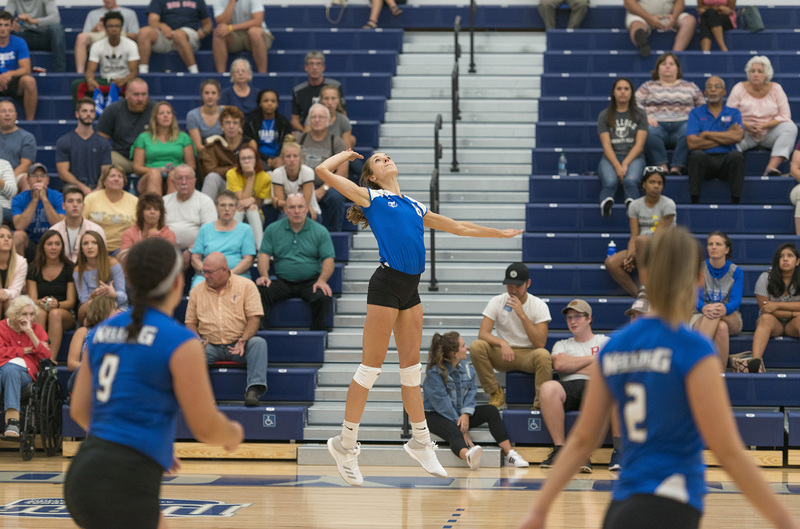 The Bruins’ next home match starts at 6:30 p.m. Tuesday, Sept. 4, against conference opponent Kalamazoo Valley Community College in the Miller Physical Education Building.